​​Students are allowed to borrow library books during each visit at the Eastside Elementary School Library with just a few exceptions. 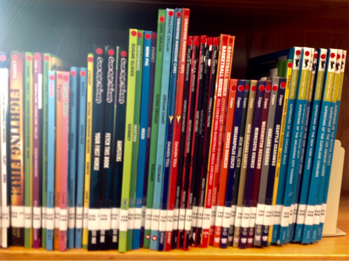 When students choose to take those books home (1st grade students are not allowed to take library books home), it is the student's responsibility to take proper care of their library book. Grades 1 through 3 are allowed one book while grades 4 and 5 are allowed two. If library books are not returned, reported lost, or returned damaged beyond repair, it is the student's responsibility to cover the costs of replacing that book/s. If a student finds themselves in this situation, their borrower's privileges are revoked until the book is returned or the fine is paid. Please help your child take care of their library book while at home! ​Go Beyond the walls of your library with the Destiny Quest mobile app! The Eastside Elementary Library is proud to announce that students and staff can now use the powerful searching application, Destiny Quest mobile app, to browse the library’s collection – anytime, anywhere - from an Apple iOS or Android mobile device. By browsing through the collection with the Destiny Quest mobile app, users can search for Follett eBooks, check out an eBook and download it to their iPad or Android Tablet. To get started, students and staff will need to download the free Destiny Quest app from the App Store or Android Google Play. They will then need to set up the app by inputting the following Destiny URL acsc.follettdestiny.com and then select Eastside Elementary. Each student will then have to type in their username and password. If they do not know their username and password, they will need to ask the librarian for details. Once students have access to the Destiny Quest app, click on the FollettShelf and then the eBooks icons. If you have followed all of the steps above, your student should now have access to our eBook collection on their mobile device. This collection can also be accessed through a PC. Simply type in the following URL http://acsc.follettdestiny.com. Once you have located the site you will have to choose Eastside as the school, Catalog, and then Destiny Quest. Once your student has access to destiny quest, they can then log on to their account just like they do in the library. Students can browse our regular book collection or they can click on FollettShelf at the top, in order to access our eBook collection. eBooks can be checked out and read at home on a PC. I know everyone will enjoy this new service!